WANG Yue, XU Zhenhua, SU Rongjian. Effects of Exocrine Glucose-regulated Protein 78 on Invasion of Hepatocellular Carcinoma[J]. Journal of China Medical University, 2018, 47(7): 589-592. Abstract: Objective To investigate the effects of glucose-regulated protein 78(GRP78) secreted by hepatocellular carcinoma(HCC) cells on the invasion of HCC. Methods HCC cell lines SMMC7721 and PLC5 were treated with recombinant human GRP78(rhGRP78). The Transwell assay was used to determine the invasion potential of HCC cells. Confocal microscopy was used to observe the formation of invadopodia. Immunoblotting was employed to detect the expression and phosphorylation levels of cortactin, focal adhesion kinase(FAK), and c-Src protein kinase(Src). Results The invasion of HCC was significantly enhanced by exposure to rhGRP78. The formation of invadopodia and the phosphorylation of cortactin, FAK, and Src were markedly increased. 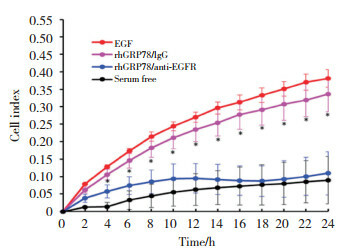 The pro-invasive effects of rhGRP78 were inhibited by blockade of the epidermal growth factor receptor(EGFR) using an anti-EGFR monoclonal antibody. 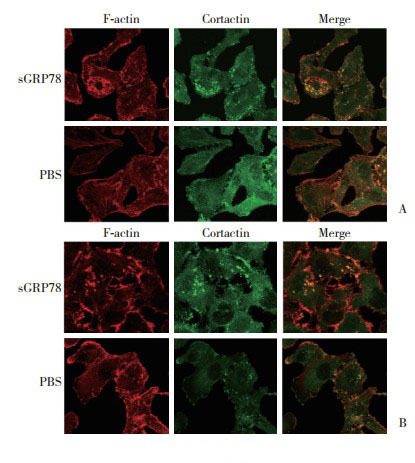 Conclusion Secreted GRP78 from HCC cells promotes the invasion of HCC cells and the EGFR signaling pathway plays an important role in the pro-invasive activity of exocrine GRP78. TORRE LA, BRAY F, SIEGEL RL, et al. Global cancer statistics, 2012[J]. CA, 2015, 65(2): 87-108.